While the nature of funeral services has changed since C. Abram Snyder began serving the community in 1940, you’ll find that his commitment to helping others in their time of need continues after four generations. 1865 141 E. Orange St. was first constructed by Reuben Baer and served as his and his family’s personal residence. 1917 The Baer family mansion was sold to J. Fred Fisher. He turned it into a funeral home and named it J. Fred Fisher & Sons Funeral Home. His first funeral was for an inmate who was hanged at the Lancaster County Prison. 1940 One of Mr. Fisher’s employees, C. Abram Snyder purchased the funeral home and moved his family into the apartment above the business. 1945 To accommodate his growing business, C. Abram Snyder purchased the Killian property at 135 E. Orange St. which is located next door to the funeral home. Mr. Snyder used the back yard of this newly acquired property to provide additional parking for the funeral home. 1954 In 1954 the operating room was moved from the second floor of the carriage house to the main building of the funeral home. 1955 A major renovation to the funeral home was completed as a selection room was added and improvements were made to the operating room. 1956 The buildings were purchased by Snyder/Iredale Realty Corporation, which was owned by Mr. Snyder’s son Kearney and Kearney’s brother in-law Donald Iredale. The funeral home was appropriately renamed the Snyder/Iredale Funeral Home. 1968 Kearney Snyder became sole owner and the funeral home became Kearney A. Snyder Funeral Home. 1969 Additional renovations took place to the second floor of the carriage house as it was converted to commercial space and rented to AC&S Corporation for 10 years. 1979 The second floor of the carriage house was once again remodeled, this time to serve as residential apartments. 1980 The operating room was moved to the basement floor of the main building creating additional office space to keep up with the thriving business. 1988 Kearney A. Snyder sold the business to his son-in-law and daughter, Mark and Diane Snyder DeBord. 1992 The crematory was added in the Carriage House, and for 18 years was Lancaster’s only funeral home with an on-site crematory. 1995 The business’s real estate was purchased by Mark and Diane Snyder DeBord officially making Mark and Diane the third generation to own the business and real estate. 1997 Kearney A. Snyder retired after 42 years of serving Lancaster County as a licensed funeral director and active member of the community. 2006 Kearney A. Snyder Funeral Home acquired the Richard A. Sheetz Funeral Home at 2024 Marietta Avenue in Lancaster. 2010 Mark and Diane’s eldest son Jeremy R. DeBord graduated from mortuary school and returned to Lancaster to enter the family business as the 4th generation. 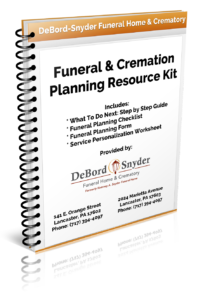 2015 The names of both Kearney A. Snyder Funeral Home and Richard A. Sheetz Funeral Home was changed to DeBord-Snyder Funeral Home & Crematory.